I'm Kishore Nagarigari, a.k.a cishore (online). 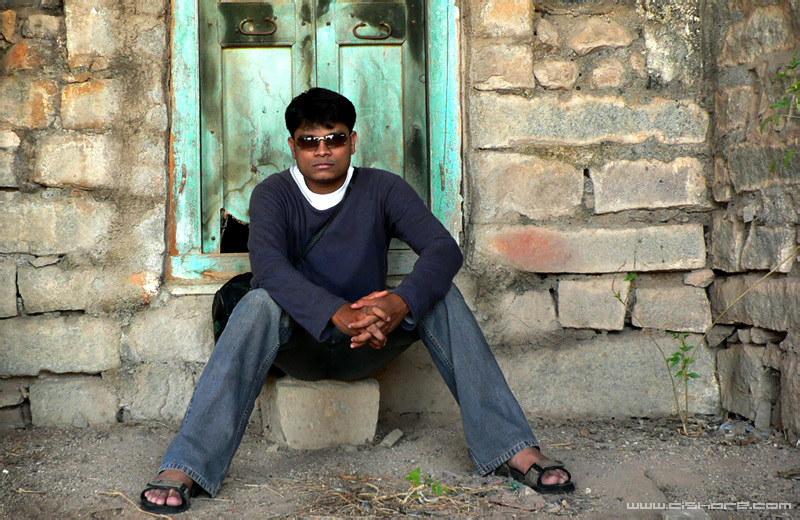 I'm an amateur photographer based in Hyderabad. I Love Hyderabad! I still remember someone asked me about Hyderabad culture. I know it but at that point unable to put my words together. Hyderabad is known for its rich history and culture with monuments, mosques, temples, a rich and varied heritage in arts, crafts and dance. To the very name, Hyderabad emanates Muslim culture. To speak the truth it is not limited to just one religion, caste, creed or sect. Hyderabad is a mixture of diverse religions, castes and creeds. Also it is very famous for Pearls besides the historical buildings and museums. It has perfectly tuned itself to the changing trends of the world. Coming to Professions, Hyderabad has good base for IT, Micro Biology, MBA, Fashion Technnology, Hotel Management etc., World has already named this city as Cyberabad for its forward march in the IT field. Hyderabad is the dream place for anyone, anytime. Muhammed Quli Qutb Shah (1580-1612) the son of Ibrahim Quli Qutb Shah ascended the throne at the age of 15. 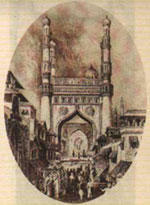 The famous Charminar, Char Kaman, Badshahi Ashur-Khana, Jame-Masjid, Daru-Shifa were built during his reign. Nawab Mir Yousuf Ali Khan, Salar Jung III was famous for his collection of antiques and beautiful objects from all over the world. His collection can be seen at the Salar Jung Museum and is regarded as the largest one man collection in the world. Charminar built in 1591 by Sultan Mohammed Quli Qutb Shah, the fifth rifler of the Qutb Shahi dynasty, is a masterpiece of Qutb Shahi architecture. The profuseness of stucco decoration and the design on the balconies are remarkable. 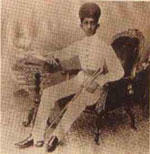 Mir Osman Ali Khan, Nizam VII celebrated his Silver Jubilee in 1937. A special gold plated chair was made on this occasion with his crest inscribed. The chair is now in the Purani Haveli, in the Jubilee Museum. Golconda Fort, the capital of the Qutb Shahi kings and the seat of the Provincial Governors, was famous for its diamond mines. It is one of the largest forts in India and has eight gates. Badshahi Ashur Khana was built by Muhammed Quli Qutb Shah in 1594. Nearly four centuries later, the Ashur Khana still exudes a certain freshness, as the enamel tiles have retained their lustre and vibrant colours. 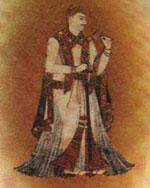 Sherwani was adopted as the court dress of Hyderabad during Nizam VI's time. 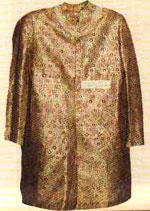 It is a long coat extending below the knees worn with a loose pyjama or churidar. It remains a popular dress even today. The city is famous for its Pearl industry and these pearls are exported to various parts of the world. The famous Kohi-Noor diamond which is affixed in the Queen of England's Crown was mined in 1656 at Kolur near Krishna district which was a part of the Golconda kingdom. Gun Foundry located opposite the Mahboobia Girls School was one of the several cannon and cannonball factories set up in 1786 by the French General Monsieur Raymond. This is the only existing gun-foundry today as the rest were dismantled. Lad Bazar - is one of the oldest shopping centres of Hyderabad. Noted for the sale of traditional bridal wares such as bangles, textiles, cosmetics, this shopping centre attracts many tourists. A collector's item, this one rupee silver coin of the Nizam's Dominion shows the Charminar on it. Today the value of each coin is about Rs. 125. 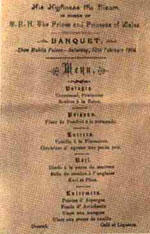 Menu Card of a dinner party given by Nizam VI in honour of Prince & Princess of Wales at Chow Mahalla Palace in 1906. 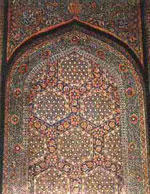 The Mosque on the western side on the roof of Charminar is one of the finest mosques built by the Qutb Shahi artisans. Mauzam Jahi Market building was inaugurated by Nizam VII in 1935 and the building was named after Mauzam Jah Bahadur, the second son of Mir Osman Ali Khan. Saroornagar Palace was built by Mir Mahaboob Ali Khan, Nizam VI in 1804.Later he donated the palace for an orphanage - the 'Victoria Memorial Orphanage'. The photograph shown here is that of a "hucca" base. Bidriware - originally a cottage industry of Bidar is also made in Hyderabad. 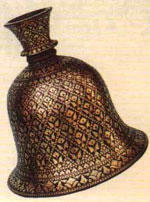 Bidriware is made of a special alloy with fine silver or gold work on it. The tomb of Muhammed Quli Shah, the founder of Hyderabad. It represents the first attempt at building a tomb of gigantic proportions to impart the monument an imposing stature. Rich ornamental parapets and turrets at the corner are distinctively visible. A customary practice followed by the nobility and the rich was to offer perfumes called 'itar' to visitors at the time of their departure. The itars were kept in beautiful glass containers called 'itardans'. Commemorating 50 years of Deccan Chronicle, the Postal Department issued a "Deccan Chronicle Golden Jubilee (1938-1987)" stamp, after cancelling the First Day cover with a "J.Krishna Murthy" stamp. This marked a special occasion, both, for Deccan Chronicle as well as Postal Department. Mir Mahboob Ali Khan, Nizam VI was extremely fond of good clothes and maintained one of the largest wardrobes in the world. His wardrobe measuring 240 feet still exists at the Purani Haveli Palace. Nizam VII's was made in England with his crest 'KK' denoting 'King-Kothi', inscribed on each plate. Chowmahalla Palace, situated near the Mecca Masjid was built in 1750 by Salabat Jung. Hyderabad was the only state in India where the ruler was allowed to print the currency notes. This 100 rupee note was introduced in 1918. 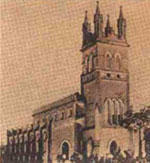 A view of the St. John Church built in 1867. The tomb of Michael Raymond, a French Military Commander during the reign of the second Nizam. First adhesive stamp of the Nizam Dominion introduced in 1866, it is considered a masterpiece of calligraphy. Asman Garh Palace -Sir Asman Jah, the Prime Minister of Hyderabad(1887-1894) built this palace at Malakpet as a shikar rest house. At present the Palace houses the Birla Archaeological Museum. The famous Abids shop belonged to the valet of Nizam VI. Today the whole street is known as Abid Road. This photograph taken in 1902 shows Abid's shop and his cart. The High court stands on the south bank of the river Musi. This is one of the finest buildings in the city which was completed in 1919 during the reign of the Seventh Nizam. 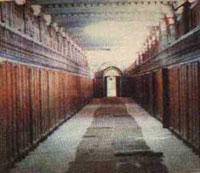 The construction of the Residency was completed in 1868. Its is now the University College of women. The legislative assembly was originally a Town Hall. 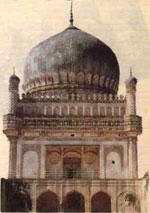 The citizens of Hyderabad raised money to build it to mark the 40th birthday of Nizam VI in 1905. 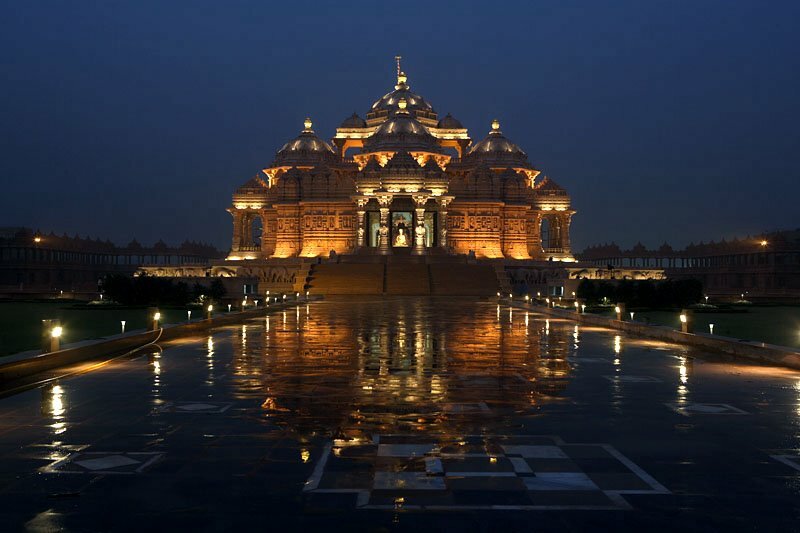 The beautiful temple is situated near the Nehru Zoological Park. It was built in 1822 by Raja Raghu Ram Brahma Katri. The Falaknuma Palace was built by Sir Viqar-ul-Umara, a Paigah noble in the late 19th century. In 1897 it was bought by the Nizam VI. High court crest of 1911. Azam Jah Bahadur (Prince of Berar) and Princess Durru Shehwar at the Fateh Maidan Pavilion - 1936. The main entrance of the famous Golconda Fort, situated on the eastern side. The design of peacocks and lions is a blend of Hindu - Muslim architecture. The palace of Maharaja Kishen Prasad who was the Prime Minister of Hyderabad from 1900 to 1912. Three granite walls of megalithic construction encircle the Golconda Fort with the outermost wall having a circumference of about 7 kms. 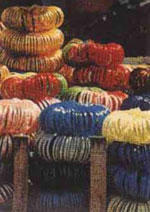 Wearing of waist belts also known as 'Buglus' was compulsory at all official functions during the reign of the Nizams. Purani Haveli also known as 'Haveli Khadeem', which means old mansion, was constructed for Sikander Jah (1803-1829) by his father Ali Khan Nizam II. Nizam VII Mir Osman Ali Khan was one of the richest men in the world during the 1940s. He is seen with his daughter-in-law, Princesss Nilofer, who was considered one of the most beautiful women in the world. The Nilofer hospital was named after her. The Jubilee Pavilion, situated in the Public Garden, was built by the Seventh Nizam in 1937 to commemorate his Silver Jubilee. Basheer Bagh Palace - constructed by Sir Asman Jah, a Paigah noble and Prime Minister of Hyderabad (1887-1894). However the Palace was dismantled but the area is still known as Basheerbagh. In July 1934, Mir Osman Ali Khan, Nizam VII laid the foundation of the Osmania University. 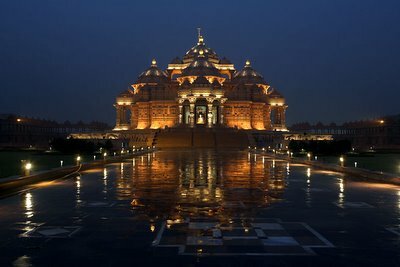 An imposing granite structure, it is the example of late Osman Shahi architecture, which combines the Hindu style with that of "Saracenic". 'Masnad' was made of red velvet with gold thread work on it. 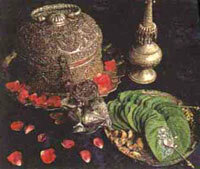 It was used on special occasions like marriages and certain ceremonies. A Plaque on the Ronald Ross building at Begumpet. Sir Ronald Ross received the Nobel Prize for his discovery that the Anopheles mosquito causes Malaria. Birla Planetarium, one of the most modern planetariums atop Naubhat Pahad. Intricate work on the Fateh Rahbar Gun which was brought by Aurangazeb during the conquest of Golconda in 1687. Located at Golconda Fort. Crest of the Hyderabad contingent. Hyderabad Contingent was formed during the reign of the second Nizam (1762-1803) and was considered one of the best cavalry regiments in India. A view of the Tank Bund in 1902. Nizam VI (1911-1948) was considered one of the richest men in the world, during his life time. 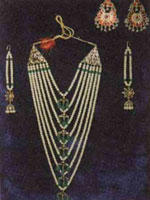 A few pieces of Jewellery collection are shown here.